About a third of women will give birth via cesarean section or c-section. In addition to being the birth of your baby, it is also abdominal surgery. This can mean you will have a different recovery than if you had had a vaginal birth. Knowing what to expect and with proper planning, you can alleviate some of the stress and strain surrounding this recovery period. C-section recovery is something that is done in stages. Right after your cesarean surgery is over you will be wheeled into a post-operative recovery room. Usually, there are several beds in one room separated by curtains. You will remain in recovery for a varied amount of time, depending on the anesthesia that you had (general or regional), typically it's about a two to four hour period. If you had an epidural or spinal it's about the time you can wiggle your legs. If you've had general anesthesia you may fall asleep and wake up repeatedly, and possibly feel nauseated. During this recovery period, your vital signs will be monitored carefully and the firmness of your uterus will be periodically checked. As will the flow of blood. You may begin to feel afterpains as your uterus contracts down. The best advice for recovery is to begin to move as quickly as you can. Obviously, you will want to start out with simple things like breathing. While breathing sounds like an easy thing, taking a deep breath is not that easy; remember to begin to do this early and frequently. As you move to your regular room some of your equipment will be coming with you, including your catheter, blood pressure monitors, and IVs. The catheter will usually be removed the day after your surgery. The IV will stay until your intestines begin working again, as evidenced by rumbling sounds in the intestines and possible gas pain for mom. Avoid carbonated, hot or cold drinks as they tend to cause gas pain to be worse. You will feel pain from the surgery and it's important to deal with it early on because the less pain you feel the more likely you are to be up and moving about, which is key to a speedy recovery. If you've had regional anesthesia you may have been given Duramorph prior to the removal of the epidural catheter. This provides pain relief for up to 24 hours after surgery, without the use of IV, IM (intramuscular) or oral drugs. After that period or if you've not had Duramorph, you may request medications for which your doctor has left an order. Some patients will also leave surgery with a special pump on their IV that allows them to dispense their own IV pain medications when it unlocks every so often. These are also used mostly for the initial 24 hour period. While medications will get into breast milk, some are better than others for nursing mothers, talk to your doctor and the baby's doctor about what is right for you and your baby. Splint your incision by holding a pillow over it. Your insides will feel like they are falling out, but they are held in places by several layers of stitches and staples. Avoid the tendency to lean forward, stand up straight. Do not look down, but focus on an object as a goal: the chair, the bathroom, etc. Always begin your walking with help. Walk as frequently, even if only a few steps, as possible. It is important to walk as soon after surgery as possible to help prevent deep vein thrombosis (DVT). Before you are able to walk or if it will be a while before you are able to walk, it may be suggested that you use compression boots to help prevent DVT. One thing that surprised many women, including me, was the numbness and itching. 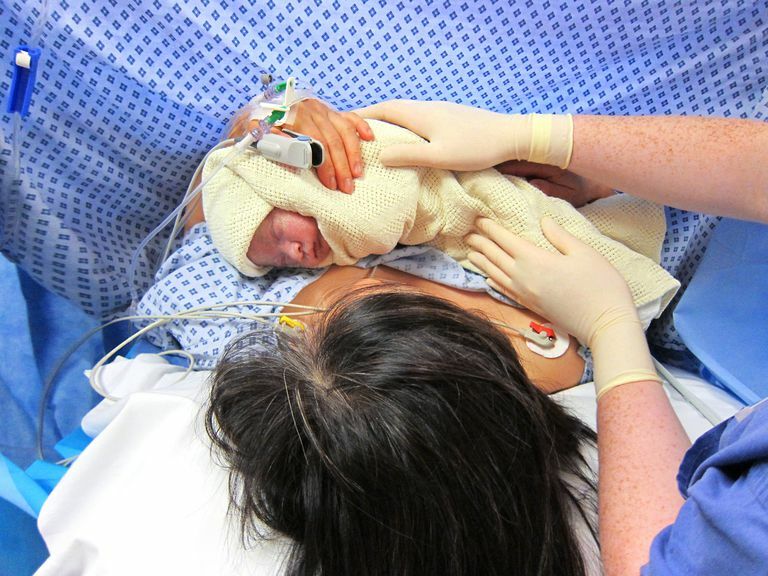 Numbness after c-section is completely normal. This is supposed to go away within a few weeks but doesn't always. It doesn't indicate that there is something wrong. The best advice that anyone can give you, whether you're at home or in the hospital, is to rest. Rest is very important after any birth and particularly true when you add the surgical aspect, even if you did not labor. Ask that visitors wait for a while, enlist the help of hospital staff at keeping them to a minimum. Be sure to ask for help from your friends and family who offer. And sleep whenever possible. Your baby may need special care, particularly if that was the reason for the cesarean. So he or she may spend extra time in the nursery. If this is the case ask that your bed is wheeled to the nursery or a wheelchair as soon as you are able. If your baby is doing well after the birth and is healthy, you may be able to hold your baby through the entire recovery room period, bringing the baby to your postpartum room with you. Even if you are feeling sleepy or in pain, your family members can help you with the baby while in your room. Breastfeeding is also still possible after a cesarean, although the positioning may be a bit trickier with your incision. Pain medication can help relieve some of this and there are also great tips on positions to be had from the hospital lactation consultant, breastfeeding educator, or your local La Leche League. Side lying is a great position to nurse in because it takes so little effort on your part and the baby avoids the incision. The football hold is also great, prop up with a lot of pillows for this one. Your emotions, as with any new mom, will probably be all over the place for the first few days. In addition to the new mom feelings, you may have certain feelings about birth. You may have been afraid when told that you needed a cesarean, that something was wrong with you or your baby. That may have ended with relief as a healthy baby was born, or more fear if your baby had to go to the special care nursery. You may feel disappointed about the way things went or that certain things didn't happen, like a vaginal birth or breastfeeding your baby in the recovery room. It's okay to have these feelings or questions. The questions can be asked of those who were around, your doctor or midwife, your partner, the nurses. get explanations, which will explain why the surgery was necessary. It's important to realize that these feelings need to be dealt with just as much as the physical healing. Some women don't feel negative about their cesareans, and that's one part of the range of normal as well. It's neither right nor wrong to feel either way, but it's important to remember that each side of the fence is valid and that we must be supportive of this mother, no matter how she feels. Mackeen AD, Khalifeh A, Fleisher J, Han C, Leiby B, Berghella V. Obstet Gynecol. 2015 Oct;126(4):702-7. doi: 10.1097/AOG.0000000000001043. Pain Associated With Cesarean Delivery Skin Closure: A Randomized Controlled Trial.